Things have not been going to plan as of late. 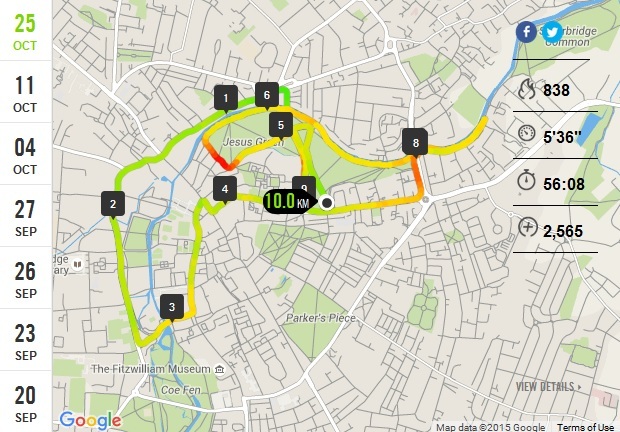 A post Berlin Marathon knee injury has meant no training for a month. 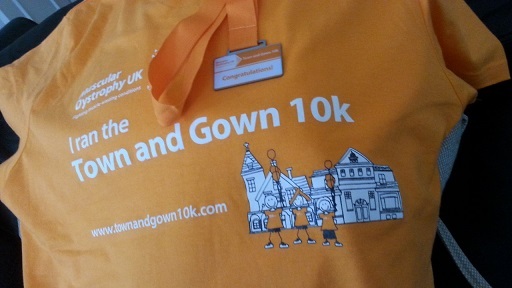 Add on that a two week head cold that went to my chest and then arguably the worst stomach bug I have had in an age and the Cambridge Town and Gown 10K for Muscular Dystrophy seemed to be a NO-GO right up to the day. But with those things all ganging up against me maybe it was a twist of fate, or rather the end of British Summer Time, and that extra hour in bed to recover changed it all. I was pretty ill last night, something to do with chicken, my insides wanting to be outside like a slumbering demon wanting to break out of it’s ancient crypt and start destroying the world and I really thought it was game over for my second post marathon race. It wanted out, whatever it was. The only other race I have completed since Berlin was the Petts Wood 10K with Berlin #ukrunchat team mate Jenni Morris. So, as I limped up to the start of the Cambridge Town and Gown 10K, of course it was fate that one of the Fassbender and Rausch mob would be there. Fortunately Chris Holt was not wearing his Berlin shirt, or it could have been embarrassing. But seeing the boys was the shot I needed to focus myself on the race and not my knee, or my cold, or my rotten guts and so I took my spot near the 55 minute marker of the 1500 strong crowd and decided to do my best on a looping closed loop that took in the park, the River Cam and the Kings Way by the colleges. Pretty abysmally I thought initially. My knee was taped up with K-Tape, even though I did have a knee brace in my bag. I ran without pain for perhaps the first 3K before my knee niggle started. The niggle was replaced with discomfort as I reached 5K and the water table, and 500 yards later I was in pain and walking (that is the red bit in the middle of the map). What should have been an easy amble around Cambridge was turning into a disaster. And, hold on, I was in Cambridge? Why the Hell was I in Cambridge, surely I had booked the Swiss City Marathon in Lucerne for this weekend? Well, yes, I had but with the cost of Berlin and subsequent injury I decided a pricey long weekend for Europe’s most beautiful race would wait another year, and so I deferred. From the moment I started walking I knew something was not right with my knee and so I kept going but slowed down to almost a jog. I let swathes of people pass me, after all, I would never see them again, or I may, but under different/better circumstances. I did see Pan Can runner Phil Gray though, which was good, we had a chat early on as I started to discover that with no training or running for a month, and post-cold I felt utterly out of shape. And so as I rounded the park for the last time and crossed the line in 56 minutes I was actually pretty surprised. I had walked, I had stopped to take water on at both water tables, and I had slowed down to a limping jog for the second half of the race. Goodness knows how well I would have done if I was fit, healthy and paying attention. I think this is medal number 90! And there was a T-shirt in the goody bag too, that was very welcome on the trip home. I have lost virtually all my fitness from the marathon training and need to get on it as soon as I can. 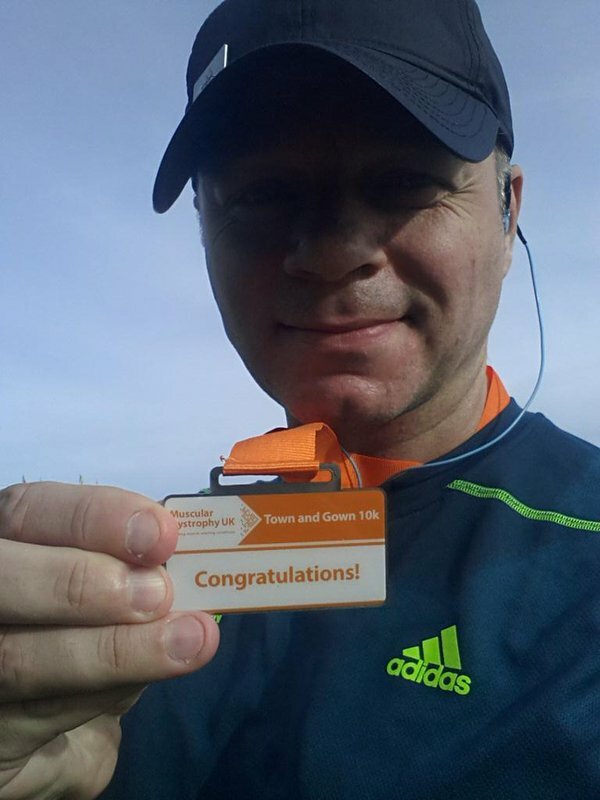 I have booked four marathons for 2016, and may well do 5 if I can get my body working again. And that has been the issue for me of late. I have just been injured or sick, and have not been enjoying myself. So, finishing in 56 and knowing I could have knocked 10 mins off that did me good. I am glad, despite being ill until late into the night that I made the effort and went to Cambridge. The race was tough and I am hurt but I am glad I did it. I am glad to have caught up with Phil and Chris and the bling is already on the rack. 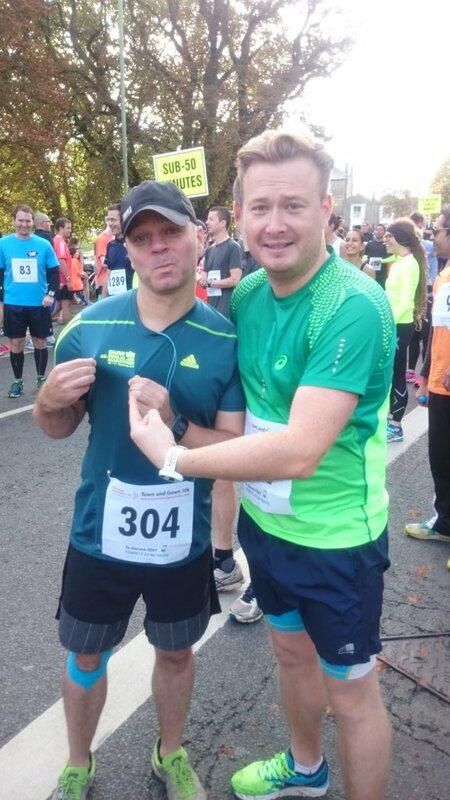 I just need to decide if I am running next weekend at the Mile Challenge and the Richmond Trick Or Treat 10K. And if I do run them, if I drop down to the 5K for the latter. 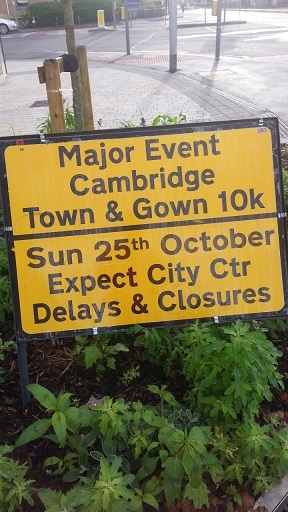 Would I run the Cambridge Town and Gown 10K again? Actually I probably would. I would like to run it without the impairments of the day, and to post a far far better time. Would I recommend it? I would, if you can get there.